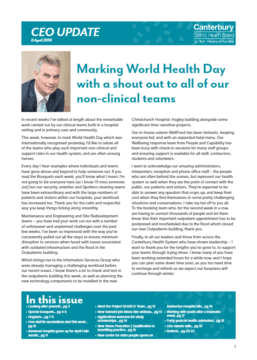 Chief Executive David Meates acknowledges the vital contribution of staff from non-clinical areas of the health system. He encourages staff to book in for a flu vaccination and confirms the Outpatients building will be closed until at least Monday 15 April. He also provides an update on the number of patients from the mosque attacks who are still being cared for in Christchurch and Auckland. This issue also includes a message from the Governor-General, features advice on how to look after yourself, marks a new milestone for Mana Ake with the appointment of new members of the team, celebrates the opening of a new centre for older people in Ashburton, shares some of the feedback from students participating in the Project SEARCH programme, and much more.